Want to live and work in Greece? If you’re already a citizen of the 28 EU member states (except Croatia) or Iceland, Liechtenstein, Norway or Switzerland, no problem. These citizens have the right to live and work in Greece without restriction. If you’re an American, Canadian, Australian or other non-EU citizen with plans to immigrate, be aware that Greek residence/work permits are involved in living and working in Greece. Before packing up your things or looking for a job, it’s important to understand what options are legally open to you. Greece and the EU are not open to everyone, just as your own country is not open to everyone. *Article last updated January 2, 2015. However, answers in ‘Comments’ reflect a specific case and whatever laws were in effect at the time. Be patient and take the time to read this article and the comments carefully, as it will provide you with a full explanation and answer many questions based on official documentation and real-life experience. It was a one-of-a-kind article when first published in April 2007 and is still updated with the latest information. Official, consular and expat INFO websites and forums have plagiarized this post and now offer similar (outdated) versions. 4) non-EU citizens — nationality is unimportant, whether you’re Canadian, American, Australian, Albanian, Chinese, Filipino, Georgian, Russian, South African, etc. It is a myth that U.S., Canadian and Australian citizens have an easier time, but white non-EU citizens do rank higher than non-whites and men have higher status than women. Unemployment in Greece is the highest in the EU, and alarmingly so for university educated people between the ages of 25-35, with women, immigrants and the disabled particularly affected. The demand is for uneducated, unskilled workers, and connections and cronyism prevail; this is not expected to change in the next 20 years, if ever (see “Value of a university degree in Greece“). Of the EU’s original Big 15, Greece ranks next to last in salaries (only Portugal ranked lower) at 10-25 percent of an American/Canadian salary for the same job on average; there is a minority of people securing high salaries, though most are through connections and cronyism. See, “Monthly salaries of EU countries” for a chart. The salary gap had been closing on the strength of the euro, but Greek salaries have been going down for the past 2-3 years and the EU-IMF are demanding they be lowered further. There are approximately 1 million non-EU immigrants in Greece according to the last census. However, only 537,237 have residence permits as of February 2013, even though the majority have been here an average of seven (7) years and qualify for long-term EU-wide permits. The immigration reform of 2007 changed little or nothing, and Greece and France tightened border controls and immigration laws in 2008 as promised. Police sweeps now occur daily and weekly instead of monthly and seasonally. If you are a non-Greek of any nationality, you will also face everyday discrimination and diminished chances of securing work as explained in, “Should I move to Greece?” This is especially true for non-whites, regardless of citizenship. The first type is a Schengen visa, which is valid for passage and/or entry to countries that have signed the Schengen agreement, and includes but is not limited to Greece. See, “Schengen countries” if you do not know what they are. a) Sticker-free: Citizens of some non-EU countries enjoy visa-free travel to Schengen, meaning they are not obligated to apply at the Greek embassy/consulate for a visa sticker and can visit and stay in the Schengen zone (including Greece) temporarily for up to 90 days total within a 180-day period. Americans, Canadians and Australians all enjoy visa-free/sticker-free travel to Greece. Please see, “Countries that enjoy visa-free travel to Greece” if you want to see if your country is on the list. * If you are immigrating permanently to Greece or have a job lined up, check with the Greek embassy/consulate if you need a type D visa. Most do not, but some applicants absolutely do. When applying at the Greek embassy/consulate in your homeland, staff will determine the appropriate type of visa, exceptions (countries you cannot visit), and the correct number of entries (one, two or multiple) specific to your needs and eligibility. The second type is a national visa, which is good only for Greece and no other country. These types of visas are issued to those seeking to study, conduct business or potentially immigrate only to Greece OR to those who for some reason do not qualify for a Schengen visa. b) why you are seeking to visit or stay in Greece (i.e. study, work, retirement via independent means, spouse of EU citizen…), thus giving it a further classification of work visa, tourist visa, stay visa, student visa. Both types of visas (Schengen and national) depend only on your citizenship and passport. The citizenship and passport of your husband/wife/partner/child/parent have no bearing on your visa, your passport or your citizenship, even if he/she is a Greek or EU citizen. In some countries, such as the United States, the citizenship of a spouse/fiance(e) is relevant when applying for an immigrant visa for permanent migration. — Greece does not have spouse/spousal or fiancé(e) visas. — There is no such thing as an ancestry/ancestral visa for Greece. — There is no such thing as a residence/residents visa (temporary or permanent) for Greece. — There is no such thing as a seasonal work visa for Greece. — There is no such thing as an open work visa for Greece. A work visa must be sponsored by a specific employer for a specific position that cannot be filled by a Greek/EU citizen. — There are no visas and permits for gay/lesbian partners of Greek/EU citizens. There are only national and Schengen visas, as I state above. A visa is for entering, visiting and exiting; a permit is for working and staying in a country, both during and past the validity of a visa. Upon entry to Greece at the airport or other border crossings, or even when applying for a visa at the Greek embassy/consulate, you may also be asked to produce proof of sufficient funds to support yourself according to a law passed in December 2007. See, “Non-EU travelers to Greece need 50 euros a day.” Even if you are not technically a traveler, Greek authorities have the legal right to question and request evidence of financial means from any non-EU citizen they suspect will overstay, work illegally, be a burden or is attempting to flee their country to Greece. Lastly, having a Schengen or national visa means that you were granted the right to enter, visit certain countries for the time specified and leave. It does not allow you to stay in Greece and it does not give you the right to work at any time. See, “What’s the difference between a visa and a permit?” if you require further explanation. Any work you take without first applying for a work permit is considered illegal, and authorities have the right to assess a fine or deport you if you are caught. A penalty of up to 1,200 euros and five (5) years blacklisting may also apply to anyone staying past the validity of their visa. The EU has also drafted a law to sentence illegal workers up to 18 months in jail before deportation as of 2010. See, “Overstaying a visa in Greece” for details. To stay in Greece beyond the validity of your Schengen or national visa and live and work legally in Greece, you need a permit. Your spouse or child and his/her citizenship are irrelevant, even if he/she is an EU/Greek citizen; it only depends on what citizenship you possess and, often times, if you are of Greek origin/descent. There is no such thing as a green card for Greece; ‘green card’ is a term used in the United States and does not apply outside its borders. Bottom line is: If you are a non-EU citizen without dual citizenship with the EU or Croatian citizen, you need a permit to work in Greece at any time and/or stay and live in Greece past 90 days. Having Greek citizenship would entitle you to live and work not only in Greece, but the entire EU. If you are of Greek origin/descent and have a mother, father, grandfather or grandmother born in Greece, you can claim Greek citizenship. If you were not born in Greece, do not assume you have Greek citizenship since your parents or grandparents must have staked a claim for you and been issued a citizenship certificate. Being registered in an oikogeneiaki merida is not enough. Staking a claim to citizenship through an ancestor born in any of the current member states of the EU (except Croatia until July 2015) or EFTA countries Switzerland, Liechtenstein, Norway and Iceland, would give you the right to live and work in Greece or any EU country without a permit. There are often no residency or language requirements, and applications for repatriation are processed more quickly and usually without a fee. If either of these situations apply to you, stop here, use the links I provided and follow the instructions in starting the process to citizenship. This is the easiest, fastest and most pain-free method to living and working in Greece and the entire European Union without restriction. Should the previous section on ways around through Greek or EU citizenship not apply to you, your only legal path to Greece is through a permit. How do you get a permit for Greece? There are dozens of permits, though a revision to the Immigration Code announced on October 15, 2013 will reduce the number to only 19, after it’s been officially published and passed into law in 2014. I cover the most common ones since the majority of us are not Olympic athletes, politicians, diplomats or famous. All of these permits apply to non-EU citizens of no Greek origin (descent). Why? Because if you are of Greek origin, you have the option to apply for Greek citizenship as explained above — it is a privilege to which you are entitled, whether you want it or not. 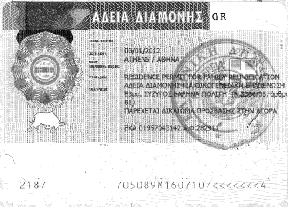 a) Residence/work permit card for non-EU family members of a Greek/EU national (First filing; validity of 5 years): If this is your first time residing in Greece and have never held a permit before, or you already possess a permit on your own accord (work, self-employed, business owner) as a single person and you marry a Greek/EU citizen, this permit applies to you. You need to prove you entered the country legally (stamp in your passport, appropriate visa, etc. ), provide a health certificate and attend an interview at the Perifereia where a board will ask questions in Greek and examine whether your marriage and family relationship is legitimate or simply an attempt to get a permit. If the non-EU citizen(s) is/are unemployed, proof of health coverage (private or via the Greek/EU citizen) and tax statements will be requested. Being married to a Greek/EU citizen does not guarantee a residence/work permit, as I know several people who were denied. If approved, the permit is valid for five (5) years, good only for Greece (not EU-wide) and has no application fee. Click, “Regular residence/work permit for an American or other non-EU family member of a Greek or EU citizen“ to see all of the requirements. It used to be that residence/work permits were separate with separate bureaucracy at separate locations; now they have been fused into one permit with one process at one location since most people need both. The work permit is given for free whether you need it or not. Being the divorced non-EU parent of a half EU child does not entitle you to a permit if you do not already live in Greece. Rights trickle down from parent to child, not the other way around. The only time a divorced non-EU parent can hold a Greek permit is: a) the parent is already living and residing in Greece with a valid permit, AND b) during those years, the child with Greek citizenship grew up, came of age and still lives in Greece AND c) the parent has sufficient financial means or work to stay in Greece. * Should you change countries, it will help to show your permit from Greece, but you will be expected to apply for a new permit in the new country. Permits are not transferable as they are wholly dependent on whether you have a valid, existing family relationship in the country you live. All EU countries have measures to prevent fraudulent marriages and “fake spouses” who marry only for papers. * There are no permits for hetero$exual fiance(e)s. There are also no permits for gay/lesbian partners married in another country. This violates an EU directive and Greece has been warned, but it will be years before the European Commission can force Greece to comply. For example, it took 5 years for Greece to implement EU-wide permits that should have been done in 2003. * There is no such thing as a family reunification visa for Greece, only the appropriate Schengen or national visas described above. — at least 10 jobs of which 30 percent must be given to Greek citizens. The permit is good for three (3) years. Partnering with a Greek/EU citizen does not absolve you from these rules. See “How to start a business in Greece” for details. In November 2012, there was discussion of allowing non-EU citizens purchasing a home to be granted residence permits but no laws were passed and this measure is not being implemented. With such strict rules and the debt crisis expected to last through 2013 or longer, many are opting for other countries. b) depositing 60,000 euros in a bank account as evidence of solvency. If you manage to jump those hurdles, you will be required to prove an annual investment of 60,000 euros at each renewal. See, “How to start a business in Greece” for more details. If you are accepted to a semester abroad or a full degree program at a university in Greece, you can apply for a visa to study. Should you be here for more than a semester abroad (more than 90 days), you would be able to apply for a permit that allows you to work part time. However, when your course of study is finished, this permit cannot be converted to a regular residence/work permit if you find an employer to hire you full time. Why? Because your original visa and permit were based on a course of study, not work. For the employer to hire you, they would be required to go through the process described in the next option. It is not impossible, but this option is amongst the most difficult and expensive, as it involves several steps, government approval, a significant monetary deposit (by you or your potential employer) and a period of waiting in your homeland. The unemployment rate in Greece hit a record-high 27.8 percent overall and 64.9 percent for youth aged 15-24 (the highest in the EU), Greeks of all ages are leaving in desperation to find work abroad, Albanians are going home, and many expats are leaving after 15-20 years due to deteriorating quality of living. Greece has no need to import workers. To illustrate how rarely unmarried Americans of no Greek origin are hired and approved to work in Greece, there are less than 2,200 existing work permits at this time, which includes non-employees (investors, self-employed, visiting consultants and students) not just employees. The majority of these permits are renewals, meaning we have all held them for years. If you think 2,200 is a lot, remember that there are 1 million non-EU citizens in Greece, of which less than 520,000 have permits. Assuming you like those odds, how do you get sponsorship from an employer in Greece for a work visa? This is the most improbable situation unless you have connections or otherwise know someone in advance, as few (if any) would hire a stranger, put up a deposit and muck through months of bureaucracy without ever having met or interviewed a potential employee. An employer prefers to hire candidates already in the country. If you have a friend, potential spouse or relative willing to hire you, new laws passed in February 2008 require private businesses to show an annual profit of 24,000 euros and companies an annual profit of 60,000 euros before hiring non-EU citizens. *Greece does not have a migrants work program. Once you and your potential employer have met, interviewed and found a good fit, you are required to go home. Why? Because in order to be issued a work permit, you need a work visa (not a tourist visa). And in order to be issued a work visa, you must go home to wait for the potential employer to complete the paperwork, submit it to OAED (Manpower Employment Agency in Greece) and interior ministry, prove that there is not a single Greek or other EU citizen who can do this job, justify why you should be hired instead, then put up a deposit of several months salary (or ask you to do it). When/if it is approved, the official work invitation letter and work contract will be sent from Greece to the Greek embassy/consulate in your homeland, which will invite you to interview on their premises and hopefully approve and issue the visa. The process from start to end could be up to a year. *If a non-EU citizen told you that he/she never had to go home and applied for a work visa once inside Greece, it’s not possible. They either have dual citizenship with the EU or are working illegally. *If you’ve thought about working for an embassy/consulate, teaching English or working at a bar for the summer, see “Common jobs for English-speaking foreigners in Greece” to learn the difference between myth and reality. If after five (5) years you are still a non-EU citizen of no Greek/EU origin not married to a Greek/EU citizen, and have held a residence/work permit in Greece with gainful employment, you would be eligible for a long-term EU-wide residence/work permit on par with being an EU citizen no matter what your profession, as long as you meet a number of other requirements. Click “Non-EU citizens seeking a long-term EU-wide residence/work permit” to see all the requirements. Illegal work is a reality, but exact figures cannot be quoted because workers often stay quiet to avoid being fired, and employers stay quiet to avoid being fined and jailed. This code of silence leads to other abuses, i.e., no insurance, poor pay, extra hours without compensation, no vacation, no pension contributions. You also risk being fired once a qualified candidate with legal standing can replace you or your employer gets scared, and you will not be entitled to collect unemployment or lodge a formal complaint at the labor union. Greek authorities have raised fines and penalties assessed to employers using illegal workers, and police are more stringent and frequent in their immigration checks since 2010. Illegal workers are hired less frequently and fired more often, as a result. The EU also drafted a law effective 2010 that can sentence illegal workers up to 18 months in jail before deportation, plus the EU border-monitoring agency Frontex opened its first European regional office in Athens, Greece in October 2010 as a show of commitment to local authorities. Illegal immigration has since dropped 40 percent. Despite the fact it is discrimination and against EU directives, this law has not been overturned for several years. 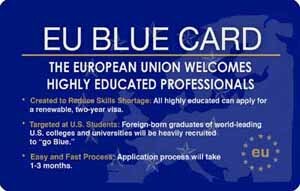 The European Commission proposed in October 2007 a “blue card” program, resembling the USA’s green card, and sent a draft to all (then) 27 member states for input and approval. Many member states immediately expressed disapproval and the intent to opt out, and there is a clause in the legislation that allows each EU member state to set or ban quotas, which many are expected to do under current economic conditions. On May 25, 2009, legislation for the EU Blue Card directive 2009/50/EC was finalized and the program was made mandatory in mid-2011. However, the euro crisis has changed implementation of the program and Greece is notoriously slow — sometimes taking up to five (5) years or more — and must be forced to implement directives by the European High Court. Further, the International Monetary Fund expects Greece to be in recession well after 2015. When/if Greece recognizes and allows people to apply to the Blue Card Program, I will write an article and link it here. Every EU member state has different rules and regulations in place for non-EU citizens wishing to live and work in their country. Many are not as stringent as Greece, while others more so. A residence/work permit grants permission to stay in a country beyond a visa’s validity, a document or sticker given to someone who fulfilled requirements and legally lives and/or works under the laws and regulations of the country that issued it. If you move out of that country, you become a resident and worker of whatever country is your new home and must secure another residence/work permit under its laws and regulations. It is not transferable. If you are a non-EU citizen not connected to a Greek/EU citizen with the coveted long-term EU-wide residence/work permit, this IS transferable and you may live and work freely throughout the EU, except in Denmark, Ireland and the UK. You must check with the new country before moving, as you may need to register, convert or give up certain rights upon arrival. A new Greek Immigration Code (Κώδικα Μετανάστευσης) 4151/2013 was drafted in October 2013 and proposes granting EU-wide status to SOME long-term residents. But it is not official and existing laws are still in effect. Therefore, you must investigate what your current Greek permit allows you to do before moving or accepting work in another country. I highly encourage readers to view ‘Comments’ on this post and other posts that were mentioned above in this article, as they contain answers to common questions and stories from people who were kind enough to share their experience. It was necessary to close the possibility of discussion because too many readers asked redundant questions and/or refused to use the ‘Search’ options in the second column as per my ‘Questions‘ policy. — First-hand experience of non-EU citizens who agreed to share their story and documents with me, including CN, PM, CO, DD, MS. This article just killed my dreams of living in Greece…well, it’s good information though, very detailed and realistic. Tina, wait! I don’t want to be your dream smasher. There are ways for Americans and other non-EU citizens to live and work in Greece, as I said. 5) Some simply have connections or catch a lucky break. All in all, a dream come true is not going to come to you, you have to go after it. 6) live your dream while you’re still young enough to recover and advance your life goals (travel, career, family, purchase a home, etc.) if living here doesn’t work out. I’d like to also point out that there are many beautiful countries in this world outside the EU. This is not the only place to live and work. I wrote the article and created this website because I want people to know the law, the bureaucracy involved and how working conditions are different. Essentially, I want people to have all of the information necessary to make informed choices and not be surprised. Sometimes surprises are good, sometimes not. Congratulations on the job well done with your website, it is very informative. I have been following your posts closely. Thank you for the wonderful information you have provided. Thank you so much for your excellent site/blog. I’ve found so much invaluable information here. This web site is wonderful! i like your site very much. it is quite informative and well designed. Thanks! Congrats- by far, the best source for problem solving, enjoying, counseling, advising Americans in Greece. Keep up the good work! You’re site is amazing and very informative! Great job!! Just found your website & enjoyed several posts including this live/work post. Thanks for all the info! Could I find wiggle room in the rules as an artist (possibly selling thru a gallery) supplemented by working remotely for a US company as an accountant? Would that scenario make me an entrepeneur? What kind of visa would that combo require? Thanks for all you help — I’m off to continue surfing your site! Getting into a gallery requires some very inside connections, and then you compete with cheaper Eastern European artists who are willing to take less than you likely would. Some people who have deals with a gallery take cash under the table, thereby skirting the need to get a self-employed status and cutting receipts. This would entail taking 20 percent of wholesale, give or take. I’m not sure why you’re mentioning a visa. Visas are for entering, visiting and exiting, not staying in Greece. Permits are for staying in Greece, as I already explained above. A residence permit is required of non-EU citizens for stays beyond the visa’s validity period (i.e. beyond 90 days if it’s a Schengen tourist visa used by an American). There are dozens of different residence and work permits; therefore, I have no way of knowing which one you qualify for; I don’t represent the Greek government. But most are based on established work in the country, retirement with independent means, being an entrepreneur, consultant or student, residence supported with funds from outside Greece, being the spouse/child of an EU or Greek citizen. Options are listed above, and you can look under the “Residence-Work Permit” category for examples. My site is a starting point, therefore I encourage people to consult Greek authorities for advice pertaining specifically to their situation. Note to readers: As per the “Comments, Questions and Contacting Me” policy, please use the ‘Search’ or ‘Categories’ BEFORE asking a question. I invested hundreds of hours and the trouble to write up a lot of useful information for everyone, the least you can do is take a look first. If I don’t publish your question or answer you via email, it means the answer is already on this site. Thank you! Hi Kat! You’re site has been so uber-useful, I can’t thank you enough. Just today I was offered a salaried position with IKA, paid vacation and bonuses, the whole shebang!!! Anyway, the company has never had any “fresh off the boat” (so to speak) Americans before – in other words, they’ve had Americans work before, but they all either had Greek citizenship or were married to Greek nationals – so the company is unsure about the exact process regarding the residence/work permit. A preliminary document the company gave me today – all in Greek, of course 🙁 – says I have to go get an AFM. I read about the AFM/Residence Permit catch-22…this frightens me. Anyway, I have to give it a shot, but I don’t know where I need to go to attempt to get the AFM (the document says “at the DOU of your area”) – is there a website where I can find the location of the office I need? I live in Tauros/Kallithea area, so I figure there’s one nearby, but beats me where it is or how to find it. Thanks a billion! Hi Kat! So hurray for me, I ran into my first brick wall here in Greece. So, as I guessed would happen after reading your posts, my local Eforia said to get an AFM I first have to get a residency/work permit from my Dimos. So I went to my Dimos (Tavros), and they said to get a residency/work permit, I have to leave the country, get a work visa, and then re-enter. They won’t allow me to apply for any residency permit w/o first seeing a Greek visa in my passport. So am I basically screwed? Or should I try going to a different Eforia and see if I have more luck (although I’m sure I’d have to provide an address and they’d see I don’t live in their area, so I’d figure I’d just be told to go back to the Eforia in my area)? I know you said people caught in the AFM-Residency permit catch-22 have had to bribe their way out…. The unfortunate part is getting an AFM and residence permit based on work requires that you exit the country and enter again with a work visa for Greece secured for you by the employer. This requires quite a bit of bureaucracy and a significant deposit on the part of the employer, and most do not want to bother when they can hire an EU or Greek citizen very easily. Love the site. You have truly provided an amazing resource on all topics imaginable. Quick question for you…I am American, however my parents were born in Greece. I recently was added to my mom’s family list (oikogeniakh merida) at the Mayor’s office in the town she was born in. Now, I am not sure what comes next. Does this give me any sort of authorization to work in Greece or do I need to go through the work permit paperwork? Your thoughts on this would be greatly appreciated! Hi there! Simply being registered in an oikogeneiaki merida doesn’t grant you the right to work or live in Greece if you yourself are not a Greek citizen. Therefore, as the article says, you need to have or get Greek citizenship since you have that option as a person of Greek origin; they will not allow you to get a permit as an American or other non-EU citizen. There are plenty of articles about those two subjects on this site in categories called “Residence-work permits” and “Greek citizenship,” and links were already provided above in this article. Alternatively, you could ask your parents or call the Greek Consulate nearest your home to advise you. This website is very cool. I am glad I found it. I am going through the same problems finding a job, trying to make friends, I just moved back after being gone for 15 years. I love it here but its really hard …I am running low on cash so my only option is to go back to the USA and come back again and give it another shot …. 1. Once I am in the country with the National Visa , while my employer file for the IKA number and permit, am I allow to start work? And how long normally does the process take to obtain an IKA number and a permit. 2. Followed by that, there is also a need for an AFM number, which I understand that the employer will take care of it. How does this process take place? Thank you for your help and I will continue to look through your site for more information. The possible options/processes that apply to you are already described in this post. 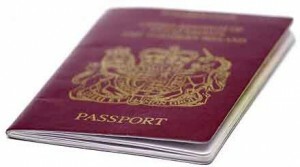 A “national visa” is for third country nationals for transit between a non-Schengen to a Schengen country within 5 days; there is no such thing as a “long term visa.” There is, however, a type ‘D’ visa that is issued to people with intention to immigrate and gives the bearer the right to apply for a permit upon arrival in Greece. Visas are for entering/exiting; permits are for staying in the country. Most employers do not apply for permits, IKA and AFMs for workers because identification and signatures require an individual to appear in person. The employer provides the work contract and letter, and the rest of it is up to you (as I say in the post); other commentators confirm what I say. The processes of getting an AFM and IKA are described in detail in other articles on this website. To answer your question, it only took me 15 minutes to get an AFM, but people will tell you it varies widely because some tax offices want to see the residence/work permit before issuing one, and some municipalities want you to show your AFM before giving you a permit (Catch 22). It only took me a half hour to get IKA, but it varies widely. It takes anywhere from 90 days to a year to get the permit as I mention in other posts, but the bebaiosi (blue receipt/certificate with photo) they give you for completing your file suffices to start work. Everything must be in place before you start work. You could technically work before that, but if the employer goes back on his word or you fail to finish your AFM/IKA/permit file, the employer is not obligated to pay you and you’ll have no right to complain or stake a claim…unless you find a kind-hearted person. Please use the ’search’ and ‘categories’ options as I request in my “Comments, Questions and Contacting Me” section. Thanks for a fantastic resource for all aspects of Greek life! I am currently in Greece with student visa I applied to my resident permit and I have currently the blue paper, I found a job here with a professional company and they are welling to hire me, I applied for TAX number and I have it, the company gave me a paper that they want to hire me and I applied for the work permit a month ago. I have an official paper saying the I applied for the work permit but my employer don’t want to take any risk and hire me, he want to have the real work permit which according to the municipality will take long time, I am so frustrated and don’t know what to do or how to make things go faster. I appreciate any hint you can give me. Fadi, I don’t make a habit of contacting readers by phone as this is a site that I run in my free time to help people and generates no income, so I removed your phone number to protect your privacy. There a few things that don’t make sense in your inquiry, but I’ll get to that in a second. First, a student visa entitles you to a residence permit, and that residence permit entitles you to get an AFM. That’s true. As a student, you are entitled to work part-time in Greece, but not full-time and not without IKA. Second, according to Greek law and municipality documentation, a resident permit secured by a student visa cannot be converted to a work permit with a company. Why? Because your visa was a student visa, not a work visa. I’ll give you an example: I have a non-EU friend who attended university here in Greece for 4 years with a student visa, which allowed him a resident permit and to work. When he graduated, he found a stable job with a big well-known bank. The bank used their connections to try and convert his student residence permit into a regular work permit, could not do it, and he is back in his homeland without possibility to come back until the bank proves that the position cannot be filled by a Greek person. When they prove it, they can issue him a work visa to invite him back to Greece, then give him a work permit. It’s been one year and nothing happened. If you and the company are indeed trying to convert a student residence permit to a regular work permit, it’ll be denied at some point. Third, you state that you already applied for the work permit and have an official paper (bebaiosi; blue paper with photo). This is where it becomes unclear. If you already applied for a work permit a month ago, you’re basically telling me that your employer has already given you a work contract and IKA, and therefore has already hired you since the official paper (bebaiosi for the work permit) is enough to start working and must be done within 8 days of hiring, which means you should already be working. So either: 1) You didn’t get a work contact and IKA, and therefore didn’t apply for a work permit, which means he never hired you; or 2) your boss did give you those things (which means he already hired you), you applied for the work permit, have the bebaiosi (blue paper for work permit) and now the employer is telling you he wants to fire you. Also note that if you do not get IKA with your work contract, the municipality will not give you a work permit; you must have both. What it sounds like to me is you never got a work contract and IKA, and you only have a residence permit based on being a student, and you’re working illegally. No matter what the case, I can tell you very certainly that there is absolutely nothing you can do to make anything go faster in Greece unless you have connections to high authorities that can make calls on your behalf. The process can take anywhere from a few months to after the permit expires. Hi, thanks for all your information. This has got to be one of the best resources I’ve seen on this subject of working in Greece. Well, my comment/question is…I’m wondering if the law on work permits for non-EU citizens changed recently, perhaps in 2006, to what it is now as you have listed on your web site. Here’s why I ask…I’m an American, no family connections to Greeks, and currently living in Greece, on a work permit that I secured through a book publisher, which was applied for in Dec 2005, approved by OAED in Feb 2006 and issued in June 2006. Originally, I came to Athens in April 2005 on a tourist visa, worked under the table with this publisher for a few months, during which time they helped me extend my tourist visa (a 6-month extension), and they agreed to sponsor me. When we decided to file for the work permit, in Dec 2005, I was told (and was already under the impression from previous information I had read) that I had to leave the country, return the San Francisco (where I’m from), and wait until the process was finished. I was to be issued a work visa at the Greek consulate’s office in SF (which I was) that would allow me to re-enter Greece as a worker (as I did), and then get the residence permit, AFM, IKA, etc. (which I have all of those now). I am really curious if the law did in fact change, because to tell you the truth, I would have much rather stayed in Greece back then in 2005 and never have gone back, but I had to, because it was the law. At least I thought so. Of course, knowing otherwise won’t take back those 9 miserable months I had to wait in the states for my work permit to be approved in Greece, but I’d still like to know! P – Finally, someone who pays attention, has something to contribute and didn’t ask a redundant question!!! Hello and welcome! Thank you for sharing your story, in fact I think it helps for people to see the process and waiting time required of an American (non-EU) citizen being issued a Greek work visa and doing things the right way. There was a delay in answering your question not only because of technical reasons and my own time constraints, but also because I wanted to research the law more thoroughly. 1) The law did not change: The law as written requires someone to be issued a work visa for Greece while still in their homeland. However, as you illustrated, it is difficult to find an employer willing to do this unless you come here and interview for the position. I know few employers in Greece who would choose to hire a non-EU citizen without hesitation, then go through the trouble of mucking through the bureaucracy to bring them over without ever meeting them. d) had insurance or could purchase it. This legalization deadline was extended to October 2007 and the IKA ensima requirement lowered, but the December 31, 2004 cutoff was never changed to include arrivals after that date. 3) Loopholes: There are a number of loopholes or lucky breaks someone could catch made possible by municipal employees who overlooked or were not informed about certain requirements, which allowed some non-EU citizens to apply for a permit without having to return to the homeland and be issued a work visa. I know two non-EU citizens of no Greek origin, who secured permits as recently as 2007 without having a work visa or a previous presence in Greece. As I did not accompany them when doing the paperwork and they are not a long-time friends, I cannot speak intelligently or verify what took place to get it done; it’s very possible they are liars and/or braggarts. I secured my original permit many years ago without a work visa, without connections and without going through the legalization drive. 4) More enforcement: This is the main thing that has changed. While other countries reap the financial benefits of allowing well-to-do foreigners to reside or work in their country with or without permits, Greece has become more rigid and stepped up enforcement of the law, while the law gets more strict and less transparent (i.e., changes are never announced) and fines/penalties get stiffer for employers hiring illegals and/or mistreating workers. There are more immigration checks at workplaces where foreigners are typically hired (English language schools, bars, tavernas, hotels/hostels, etc. ), and municipalities are less tolerant or more informed (not always, as mentioned above) when taking permit applications. Although you waited 9 months for the process to run its course, I still think it’s an accomplishment for which you should be grateful and take pride because I can count at least 1,000 people who tried and never made it. Hundreds more are illegal workers here with no alternative to getting a Greek residence/work permit. I hope that clears things up a bit. Cheers. Sorry if this is a bit redundant, but referring back to Phillip’s post of January 8 and your response, now I’m more confused than before! I’m an American (no Greek origin) married to a Greek citizen, and “in the process” (for the last year now) of relocating to Greece. My wife and son have been here for over a year (my wife having returned from the US as a returning Greek ex-patriate) and I have been going back and forth as a tourist, winding down various affairs in the US and priming the pump to start my new life here in Greece, including looking for a job. I’ve recently accepted a job offer by a Greek bank to work as a consultant for them, and I’ve now got to apply for my residence/work permit (by the way, I’d really love to see your article on that subject, but it’s no longer available on the site – would you consider allowing me access to it? It would be for my own personal use). In any case, one thing is certain: in my many discussions – both in person and on the phone – with the Greek consulate in NY, I have been told over and over again that I must apply for my residence/work permit IN GREECE, and that I will not need to return to the US and get it from them. Is this a different procedure because I am the spouse of a Greek citizen, or is this just the consulate not knowing what they are talking about (or both?…hey, this is Greece, anything is possible). This is really topical for me, as I’m about to go to our lawyer here to get him to start the application process on my behalf, and I really don’t want to go through a lengthy exercise only to be told in the end that I have to go back to the US and do it all over again from there. I’d really appreciate your insights into this. By the way, in case it matters, I already have an AFM here (since I bought some land here some years ago), which used to be a non-resident AFM but was converted to a normal resident AFM a few months ago – even without my having a resident visa. Go figure. Hi Damian, you and Philip are different cases, so don’t confuse your situation with his. As stated in my article, you apply for your residence/work permit in Greece before your visa expires as the spouse (family member) of a Greek citizen. I regret that I cannot show preferential treatment to anyone (it’s all or nothing when it comes to access), but it is quite easy and requires the fewest papers. A lawyer is quite unnecessary, however I suppose that’s a personal choice. Phillip is American, of no Greek origin and not married to a Greek citizen (he says this in his comment). He came here on a tourist visa, found a job, exited GR and came back on a work visa and got his permit, which is the correct way to do it in his case. There’s no such thing as a resident visa. I’m really thrilled I “stumbled” across your site. It’s the best source of factual information I found on Non-EU persons trying to stay in Greece. I’m in a serious relationship with a Greek man and we’ve discussed this issue often. I have read and re-read your information on Naturalization: Marrying a Greek and the resulting years of waiting. In my case it would be 10years – from the date we married. Now, does this mean that during those 10 years, I need to return to the US every 3 months, so I do not over-stay my tourist status? Also, do I actually have to come back to the US or can I just go outside of the EU to another country? We would be grateful if you could clarify this finer point. Thanks a million and your site is going to be my “first go-to” for information on Greece. Thank you.